Why not put something super nutritious, sustainable, and oh-so-tasty on your grilling skewer this summer? Oh, did I mention it’s a little leggy? We are talking about cooking delicious insects! Since my last blog concerning entomophagy a couple of years ago, this unique eating experience has become quite popular. Many companies are popping up all over the country bringing new ways to introduce insects into your diet! Insects are the new sushi. As manager of our delicious edible insect vending machine in the Cockrell Butterfly Center, I am constantly searching for new products to add to our inventory. Besides quite a few new companies, there are also several restaurants where finding a grasshopper in your fine cuisine will not result in a health code violation (see the chapulines on Hugo’s dinner menu). You may think it’s crazy, but remember, 50 years ago sushi was considered disgusting to most Americans. Now, there are almost 4,000 sushi restaurants in the US! Add some legs to your diet. When I took over the machine several years ago, we sold mainly novelty products (lollipops, etc.) because that was what was available. Now, we are working with new startup companies to introduce more “everyday use” products. I know, I know, most of you are more likely to stomp on a bug rather than chomp on a bug, but the times, they are a-changing! One of these companies that makes bug “staples” is Exo. They make protein bars from cricket flour (milled crickets). 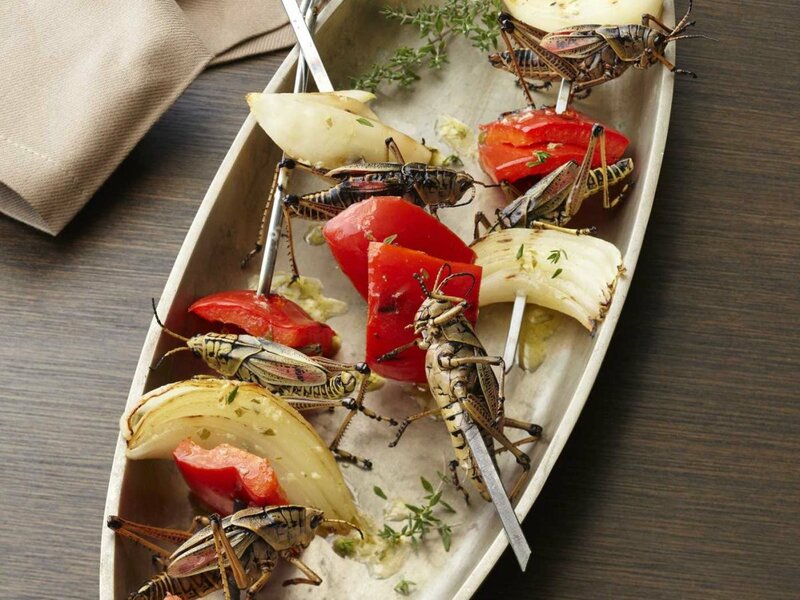 Their Web site puts it perfectly: “CRICKETS ARE THE NEW KALE. Paleo and environmentally-friendly protein bars.” They are soy, dairy, grain and gluten-free for all of you “clean eaters” out there. I bet you never thought “clean” meant insects, huh? 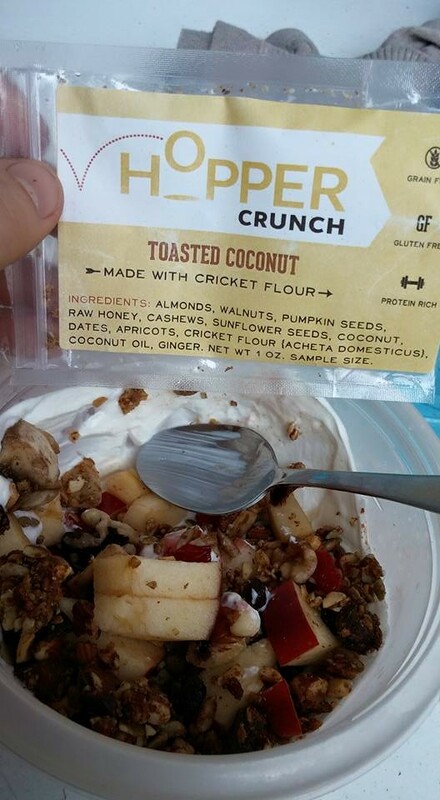 Sprinkle some of this Hopper Crunch cricket flour granola on yogurt with some fruit to make a bug parfait. Another company, Hopper Foods, based in Austin, Texas, has the mission, “to normalize entomophagy (eating insects) by creating delicious, nutritious and healthy products that people will want to eat every day.” Hopper has brought delicious, crunchy, cricket granola and no, you won’t get a leg stuck in your teeth! Six Foods has created the next best thing to chips, Chirps (ha! Get it?). Yup, chips made from cricket flour along with “wholesome beans, corn, peas, and chia seeds” (from website). In delicious flavors such as BBQ and Cheddar, where could you go wrong?! Oh, and they have the best slogan: Eat what bugs you. All the taste with 3x the protein and 40% less fat. YES! Cricket Flours is not only a great place to get flour for your recipes, but they also specialize in protein powders. Also, if you are looking for a new set of recipes, you should buy their e-book to get some ideas for your next dinner party. Look for their single-serve protein packets in our vending machine this summer! 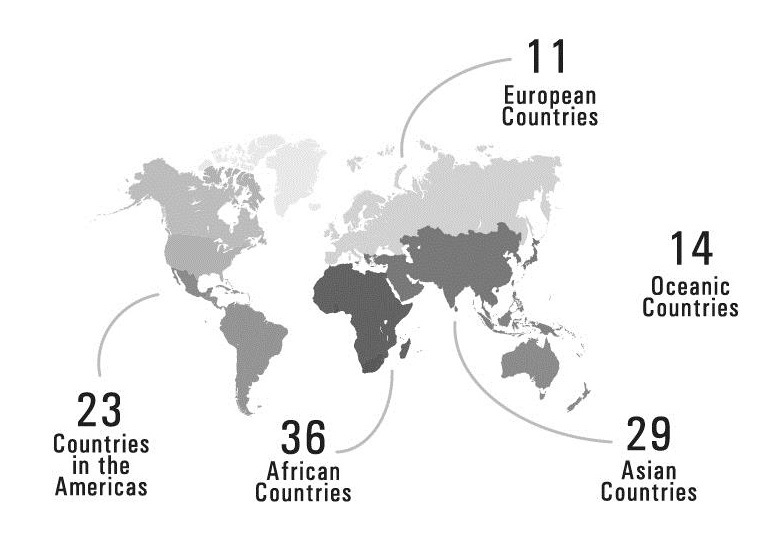 Countries that consume insects and arthropods as a food source. Like everyone is eating insects, like 2 billion people; kind of everyone. That’s not just very many, that’s A LOT! So if you’ve never eaten a bug, get out and try a bite. Heck, you might like ’em! Girl Meets Bug – On this blog, learn how to make Bee-LT Sandwiches, Deep Fried Scorpion, Waxworm Tacos, and more. 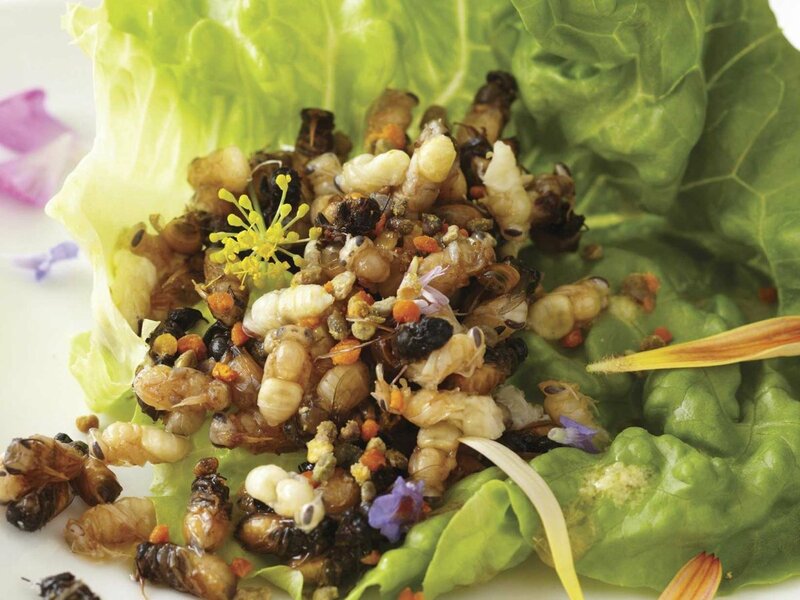 Eat-a-Bug Cookbook – Read here about David George Gordon’s latest edition of his entomophagy cookbook and take away some recipes like Three Bee Salad and Grasshopper Sheesh! Kabobs. Purchase the book on Amazon. 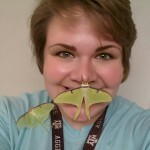 Lauren is an entomologist in the Cockrell Butterfly Center. 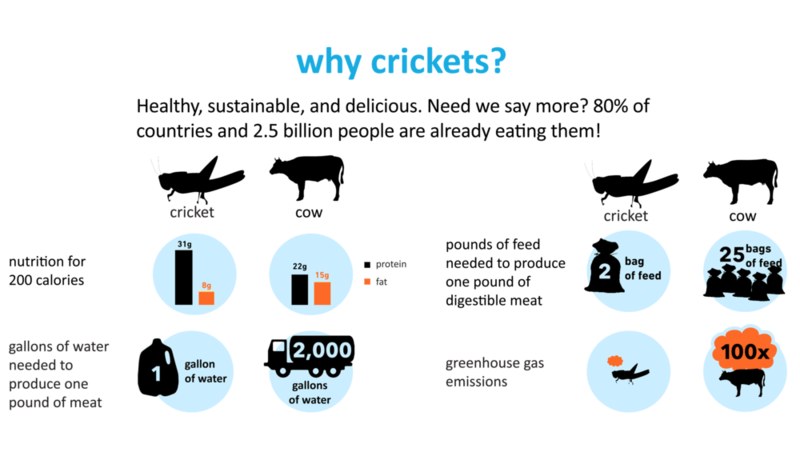 I fully support eating insects as a viable food, but I have a concern about your “why crickets?” infographic. Are those numbers for water and feed requirements up to date with current research? See http://entomologytoday.org/2015/04/15/crickets-are-not-a-free-lunch-protein-conversion-rates-may-be-overestimated/ for some more information. In particular, the USDA states a 1:6 feed ratio, making the 2 bags of feed claim more like 4 bags of feed. Also of note, the article mentions the black soldier fly as another excellent source of nutrition. Hi Brian! There is a long list of other insects that are not listed in the blog that are excellent sources of nutrition. Arthropods are definitely underutilized, especially in the United States! A lot of times other species are also quite hard to readily come by. The science and research concerning the water and feed ratios are always evolving as new studies are published. As far as I know, the attached chart is up to date but there is a lot of contradictory data floating around. We are just glad to see so much research going into the topic and that entomophagy is receiving so much positive feedback in the US. Thanks for the comment and the link! Where can I find a specific list of all the countries that consume insects?